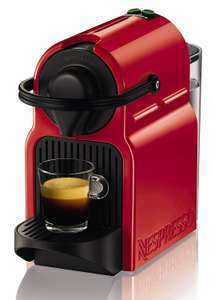 I posted a link to a DeLonghi nespresso machine on Amazon.de earlier, but have since also found this one on Amazon.it. It's slightly cheaper at €58.58 + €7.02 postage (note, the displayed price drops slightly as you progress through to the checkout, for some reason). Using a fee-free international currency credit card (such as Halifax Clarity) this works out to about £56.48 delivered. I've got this machine along with several others, personally I find Nespresso coffee is average at best and fairly expensive (great if your not into strong coffee or only drink it occasionally as the machine and pods are very compact). Other brands such as Lavazza make significantly better coffee. There have been better deals on this machine recently, PC World sold it for £59 with £10 off Nespresso voucher, 165 free coffee pods, and a free Nespresso travel mug, still some heat for the currently offer price. I've got this machine along with several others, personally I find …I've got this machine along with several others, personally I find Nespresso coffee is average at best and fairly expensive (great if your not into strong coffee or only drink it occasionally as the machine and pods are very compact). Other brands such as Lavazza make significantly better coffee. There have been better deals on this machine recently, PC World sold it for £59 with £10 off Nespresso voucher, 165 free coffee pods, and a free Nespresso travel mug, still some heat for the currently offer price. At home I grind fresh beans and use a traditional espresso machine, but I find nespresso type pods pretty useful for a quick, clean and easy solution at work (although not very environmentally friendly). I've been using a Wacaco Minipresso in the office which I'd originally bought for camping/travelling, and fancy getting a proper machine that can sit somewhere discretely and not make too much noise or mess. I find the Aldi ristretto pods pretty nice and they're only about £1.80 for 10.